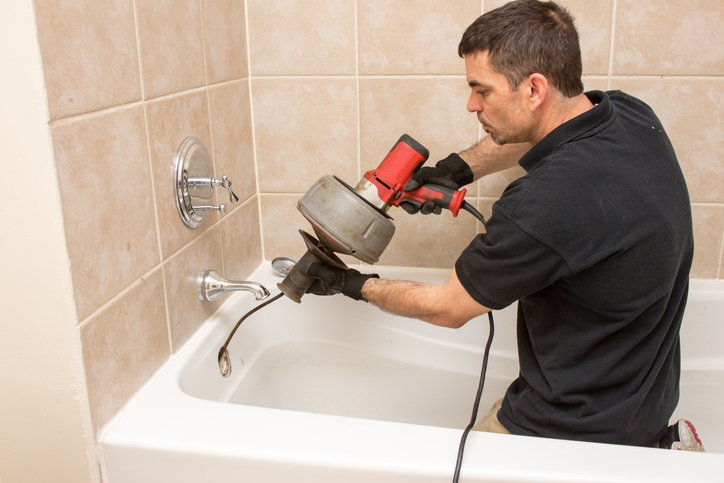 Your plumbing is easy to take for granted, but if a drain clogs, you’re sure to notice. You may not be able to prevent every clog 100 percent of the time, but with these tips, you can help keep your pipes flowing freely without the need to call a plumber. Catch hair before it goes down the drain: Hair and soap scum are the most common culprits of clogged bathroom sinks and shower drains. Prevent this problem at the source by replacing the traditional stopper with a mesh screen. Clean this out whenever it becomes clogged. Only flush toilet paper and human waste: The toilet is not a trash can, so don’t use it to dispose of anything except toilet paper and human waste. That includes facial tissues, paper towels, napkins, feminine hygiene products, and anything else that absorbs water rather than dissolving in it. Pour grease in the trash, not down the sink: Cooking oil and bacon grease may be liquid when they’re hot, but once you pour them down the drain, they coagulate and solidify, blocking the pipe in the process. This is why you should empty grease into a jar or cardboard milk container, where it can harden before you dispose of it in the trash. Discard other food particles in the sink sparingly: The garbage disposal is convenient, but it’s still better to scrape your plate into the trash before rinsing it in the sink. Also, to prevent the disposal from jamming, be careful to never put bones, fruit pits, stringy foods or coffee grounds in the kitchen sink. These either belong in the trash or your compost bin. Always run water when operating the garbage disposal: Not only does this prevent overheating, but it also helps flush particles further down the pipe instead of sticking and causing a clog. Flush the drains on occasion: Low-flow faucets are good for conserving water, but not so good at clearing the drain line. To combat this, flush your pipes occasionally with a handful of baking soda and a kettle of near-boiling water. The fast, hot flow will melt grease and carry debris away. Never pour paint, paint thinner, cement or joint compound down the drain: These chemicals can wreak havoc on plumbing lines. Even if you have a utility sink in the laundry room or garage, never dispose of these items here. Eat away at clogs with bacteria: When a drain starts to flow more slowly, pour liquid or granular bacterial cleaner down the drain. Unlike harsh chemical-based drain cleaning products, these microbes are noncorrosive and won’t harm your pipes. They also take a bit longer to work, so be sure to follow the directions for the best results. Sometimes, even the most valiant efforts to prevent clogged drains are unsuccessful. The next time your plumbing starts backing up, contact Puget Sound Plumbing & Heating at (206) 350-0079. Our drain cleaning services are second to none in the Seattle region!